Budwig Company, Inc. is a premier manufacturer of Recessed Bumpers also known as Rubber Bumpers or Bumper Feet. 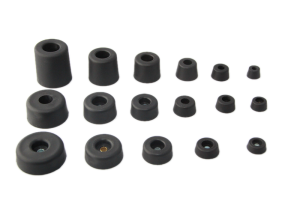 Molded from “Thermoplastic Rubber” Budwig Recessed Bumpers or Bumper Feet offer better traction, better shock absorbing qualities, greater resistance to stress cracking and have excellent non-marking qualities. For added strength and durability all bumpers include a steel support brushing. This steel support bushing absorbs the total fastener load allowing the Recessed Bumpers to be mounted using a variety of screws or rivets without causing distortion to the foot itself. The Recessed Bumpers are impact, tear, and chemical resistant. Recessed bumpers or bumper feet are typically used to prevent metal-to-metal or surface-to-surface contact and protect the metal or wood from friction. At Budwig Company, Recessed Bumpers | Bumper Feet are offered in various shapes and sizes. With over Five decades of performance, Budwig Company has created a niche in the market that offers our customers a propriety line of world class Recessed Bumpers | Bumper Feet. Budwig Company is an Original Equipment Manufacturer (OEM) and not a distributor of other brands of Recessed Bumpers | Bumper Feet. All Budwig products are manufactured at our facility in San Diego, California. Our company manufacturers a large a variety of recessed bumpers or bumper feet including Round TPR (Thermoplastic) bumpers, Square TPR bumpers, Rectangular TPR bumpers and an assortment of Miscellaneous TPR bumpers. View all Rubber feet molded products, Round, Square, rectangular – in any color. Budwig bumpers are impact, tear, and chemical resistant. Recessed bumpers and feet are typically used to prevent metal-to-metal or surface-to-surface contact and protect the metal or wood from friction. Feel free to contact us at your earliest convenience about any questions or concerns regarding our Recessed Bumpers | Bumper Feet.